The ancient Polynesians brought many plants into Polynesia from Melanesia and Asia. Was this the source of the Bottle Gourd or did it come from the Americas? In the Cook Islands there are 39 useful, or formerly useful, plants that were purposefully introduced by the Polynesian settlers before contact with Europeans. In addition there are 17 weedy plants that were probably accidentally introduced in those ancient times, although some are used in herbal medicines and might have been purposeful introductions. In total: about 56 Polynesian Introduced plants. Among the Polynesian Introduced plants there are two that probably came from the Pacific coast of South America: the Sweet Potato (Kūmara, Kūara) and the Bottle Gourd (Hue, ‘Ue). 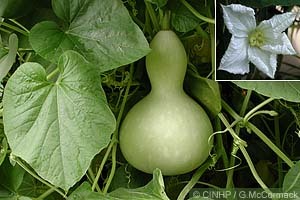 The Bottle Gourd (Lagenaria siceraria) is a large-leaved climbing vine that grows in well-aerated volcanic soils, in sunny areas with moderate rainfall. It has a large fruit, that is typically flask-shaped. The mature fruit has a very hard, thin shell, traditionally used in Africa, Asia, the Americas, and parts of Polynesia, to make a wide range of utensils. It was previously thought that the Bottle Gourd was anciently present throughout all of Polynesia, having been introduced by the early Polynesians and their ancestors from Indonesia or thereabouts. However, a recent re-investigation by Whistler (1990) showed that there was no evidence of the Bottle Gourd being anciently in Fiji, Samoa or Tonga. He reinterpreted the 'evidence' as being a misidentification of the fruit of the anciently introduced Wax Gourd, a related plant originating in Asia. The Bottle Gourd was anciently only on the high islands of Eastern Polynesia, from Hawai‘i in the north, to Easter Island in the southeast, to New Zealand in the southwest, and the Cook Islands in the tropical east. The word for the gourd fruit and plant was ‘Ue in Rarotonga and Hue elsewhere. Ipu usually referred to containers made from Hue, although it sometimes also referred to the fruit itself. The primary use of gourds was as water containers and this use was very prominent in Hawai‘i, Easter Island and New Zealand. 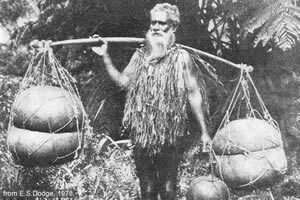 In the Cook Islands and Societies gourds were secondary to water containers made from large coconuts and bamboo stems. The second most widespread use of gourd was as bowls for food. In addition, especially Hawai‘i, gourds were used to make a wide range of specialized containers, musical intruments (rattles, drums, whistles), and toys. The Bottle Gourd is a domestic plant whose wild ancestors have never been found. As a domestic plant it has been found in ancient Africa, Asia, and the Americas. The oldest well-established evidence of domestic Bottle Gourds in the Americas is in Mexico and Peru at 6,000BC, and Florida at 5,300BC. In Africa and Asia the oldest date is in Egypt at 3,400BC, with Zambia at 2,000BC. These dates support the idea that the Bottle Gourd was domesticated earlier in the New World than in Africa and Asia. The earliest Pacific date is 350BC in New Guinea. The other five species in the genus Lagenaria are all natives of Africa and Madagascar. It is therefore most probable that the Bottle Gourd ancestor was also an African plant. The most likely scenario of its arrival in the Americas has the native fruit floating across the Atlantic and establishing itself as a native plant. It was found, domesticated and spread throughout much of the Americas by people. The ancient presence of Bottle Gourds in Eastern Polynesia and not Western Polynesia is strong evidence that it arrived here from the Americas. It was here, with the Sweet Potato, at around 1000AD when it was introduced to New Zealand. The ancient Polynesians had explored all of tropical Polynesia by about 500AD, and it is likely that one or more canoes reached South America, probably Peru, and returned with the Bottle Gourd and Sweet Potato - about a thousand years ago. Gerald McCormack has worked for the Cook Islands Government since 1980. In 1990 he became the director and researcher for the Cook Islands Natural Heritage Project - a Trust since 1999. He is the lead developer of the Biodiversity Database, which is based on information from local and overseas experts, fieldwork and library research. He is an accomplished photographer. McCormack, Gerald (2005) The Bottle Gourd (Hue, ‘Ue) of ancient Polynesia. Cook Islands Natural Heritage Trust, Rarotonga. Online at http://cookislands.bishopmuseum.org.